The next-generation Porsche 911 has been hiding in plain sight for a while now. 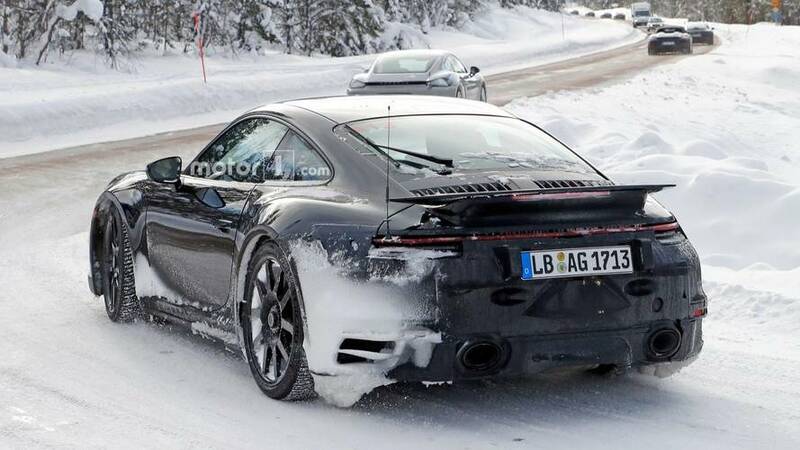 We’ve seen plenty of photos of camouflaged prototypes and even some decent photos of the rear of a completely uncovered 911 Carrera or Carrera S. Today, we have a new batch of spy photos of the new 992-generation 911, and the car is nearly completely uncovered. Despite some halfhearted attempts to cover the badges, there’s no mistaking a 911 for anything other than a 911. The car here is painted in a pretty shade of blue, accented with chrome trim on the windows and grey multi-spoke wheels. The car’s profile is nearly the same as the current 991-generation, with only the front and rear bumpers marking the difference. From this angle, the requisite round headlights look like they’re tilted back relative to the current 911. The front bumper has large, wide intakes at each corner. The corners of the hood are squared off rather than rounded while the headlights are fully integrated into the fender rather than meeting the front bumper. The rear looks about the same as the car we saw earlier this month. The new Cayenne-inspired taillights span the width of the car, a design feature that’s designated all-wheel drive models for the past few years. That said, classic rear-drive air-cooled 911s had full-width lighting, so it’s not totally out of character. We don’t know when the new 911 will debut, but expect a reveal sometime in the next round of auto shows. We expect the base 911 Carrera’s turbocharged flat-six to make at least 390 horsepower.